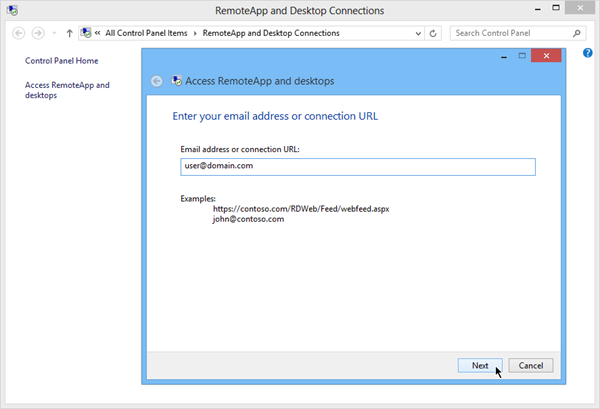 Once you have set up your Remote Desktop Services environment and published some RemoteApps you might be wondering, How do I actually deliver these remote applications to my end users? Windows Server 2012 gives you several options that offer you the ability to automatically distribute the application icons to users, and even keeps them up to date if later on you make some changes to what apps (and desktops!) are available through RDS. 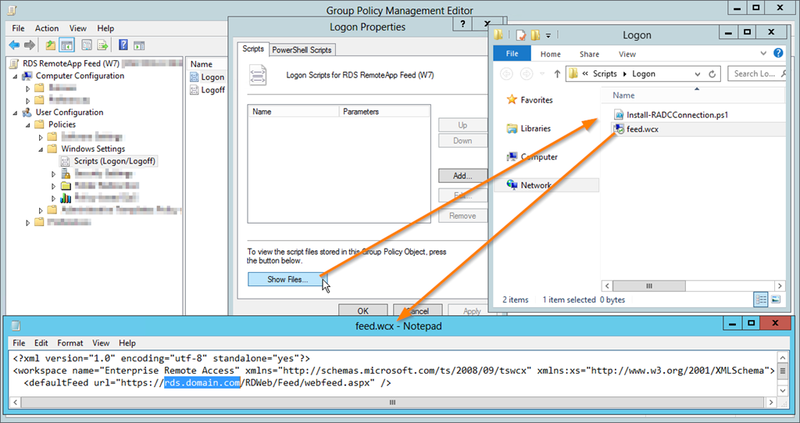 Each of the options below has a dependency on the RDWeb server role, specifically on the XML file that it generates and makes available as an RSS Feed. The RDWeb page itself is by far the easiest method since it's already done for you. This site dynamically generates the web page content, so as you add and remote RemoteApps and Desktops from your collections, they will appear and vanish from the web site. Simply direct your users to visit the URL of your RDWeb server and after they log in they'll be presented with a pretty list of apps that they can run. If you would prefer to have the RemoteApp icons appear in the Start Menu / Start Screen of the client computers, then you may want to consider using one of the next two options. 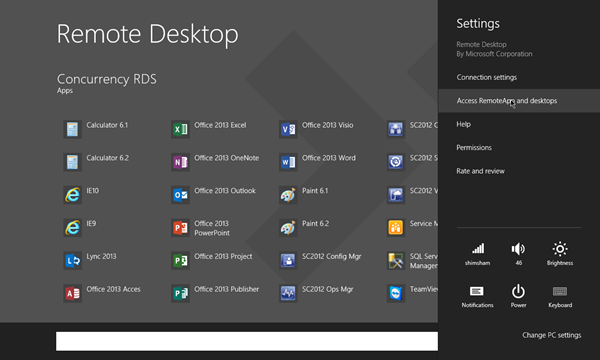 The RemoteApp and Desktop Connections Control Panel is available to Windows 7 and Window 8 clients. From this wizard you can enter in the URL for the RSS feed and it'll prompt you for the user credentials to authenticate with, and then the applications can be launched without using your web browser. Just bring up Start and click the App! One enhancement that is available only to Windows 8 users is the option to use an email address instead of the hard to remember URL which makes it very easy for your users to complete the wizard. In order for this to work you need to create a new DNS TXT record which points to the RSS feed path (but not including the webfeed.aspx). You can set this up on your Internal DNS server as shown above. Your external DNS provider should also support TXT records by now, but likely has their own DNS Management interface. Once the record exists, you can test to make sure it resolves correctly by using nslookup. Just use the "set querytype=TXT" command before entering the FDQN of the TXT record. If it returns the URL of the feed, you're good to go. Users can now enter anything@doamin.com to get their apps! Both of the methods above can be leveraged by an end user, but if you really want to push out the applications without the users needing to do anything, then you should try using Group Policy. 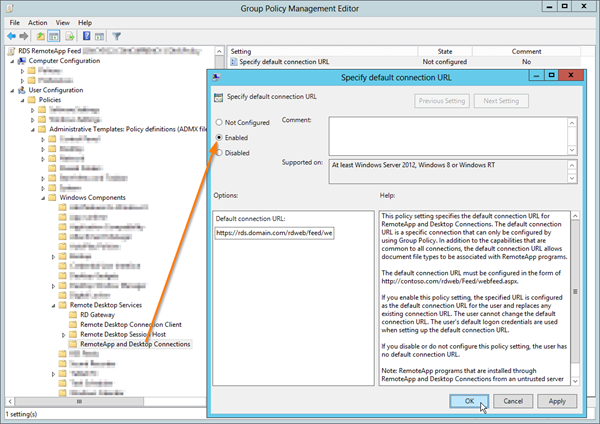 Group Policy now includes a setting for the Connection URL (rss feed) which works for Windows 8 clients. Unfortunately Windows 7 clients are out of luck here. 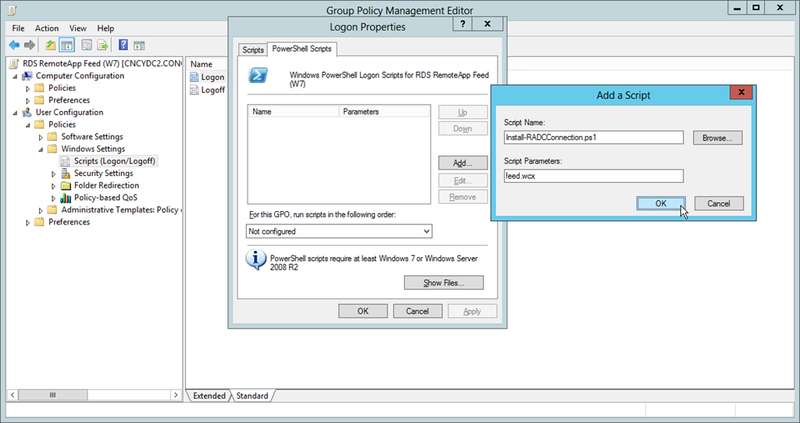 If you really want to use GPO to deploy RemoteApps to Windows 7 clients, then you have to jump through a few hoops. Now select the PowerShell Scripts tab and click the Add button. Click Browse and select the .ps1 file and for the parameters enter the name of the wcx file. 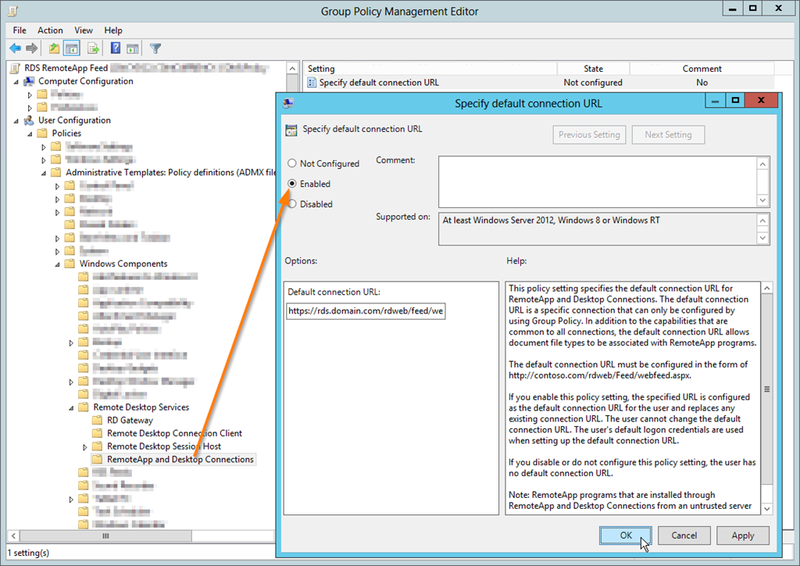 Click OK twice and you are ready to scope that policy to a set of users. The Modern Remote Desktop app is available for free from the Microsoft store which will allow your Windows 8 and Windows RT devices to use Remote Desktop sessions as well as RemoteApps. 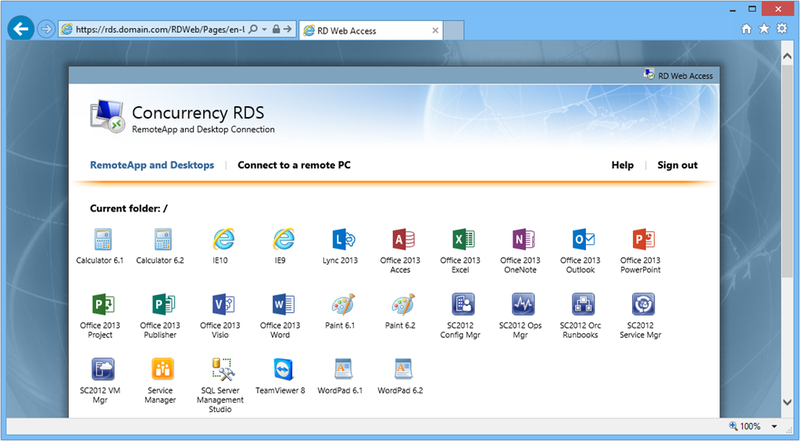 Once you have it installed, simply bring up the Settings from the charms bar and you can enter the Web Feed URL (or email address if you created the TXT record) to get the list of available RemoteApps and Desktops. One option that you might find missing from this list is using an MSI file to distribute the RemoteApps. Microsoft no longer recommends using MSI's as a distribution method for various reasons, so the option to generate them is no longer available in WS2012. That said, if you really wanted to make an MSI file, then you might consider using the Freeware Advanced Installer software to package and distribute the RDP files. Personally I prefer the self updating options discussed earlier, but to each their own!